Storm Brian has led to localised flooding in a number of cities in the Republic of Ireland, including Limerick where the Shannon river overflowed. 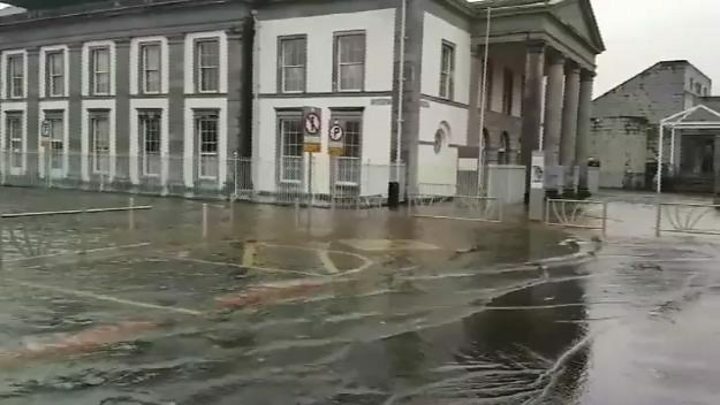 Limerick City and County Council shared footage on social media, showing flooded car parks and river walkways. However, it has no reports of homes being flooded and the damage is not nearly as extensive as that caused by ex-Hurricane Ophelia on Monday. Flash flooding was also reported in Galway, Cork, Kilkenny and Waterford. The Shannon overflow coincided with a high tide and the flooding receded when the river returned to its normal levels later in the day. There had been fears of a tidal surge in Cork but the flooding was not as bad as expected in the city, which was still recovering from Ophelia. Irish weather agency Met Éireann said Storm Brian has now passed over Ireland and is moving across Britain. It had issued several weather warnings before the storm and some remain in force even though the worst conditions have passed. An orange warning for strong winds will remain in force until 21:00 local time on Saturday. The wind warning covers the coastal counties of Galway, Mayo, Clare, Cork and Kerry. A less severe yellow warning for rain has been issued for counties Donegal, Galway, Leitrim, Mayo, Sligo, Clare, Cork, Kerry, Limerick and Waterford. A race meeting at Fairyhouse in County Meath was cancelled for health and safety reasons due to the strong winds and the Cliffs of Moher tourist attraction in County Clare was closed. Three people were killed earlier this week as Storm Ophelia lashed Ireland, with a national emergency declared in the Republic.